Collector: A person who collects things of a specified type, professionally or as a hobby. Hoarder: A person who accumulates things and hides them away for future use; acquiring and failing to throw out a large number of items that would appear to have little or no value to others. Archivist: A person who maintains and is in charge of archives; a professional who assesses, collects, organizes, preserves, maintains control over, and provides access to information determined to have long-term value. I am a collector because I collect a particular kind of cassette. I am a hoarder because I amass many cassettes before I get around to “processing” them. I am an archivist because I make selective backups as well as disseminate and publish facts and data which future generations might find useful. The (meta)data ends up in a database called Discogs. Scans end up in my personal stash, and the cassettes end up in the trash. Nobody wants those, they’re just plastic matter. But what of the audio on those tapes, the gist of it all — does that get trashed too? These aren’t rare demos of a now-famous band’s early steps, nor are they recordings of a primitive Amazonian tribe speaking a now-extinct language, and they’re most certainly not historically-significant artefacts of experimental media which I have the only surviving prototypes of. No, the vast majority is ordinary run-of-the-mill commercial product for the mass market. While I personally do appreciate the flawed sound of tapes, the “Compact Cassette” medium itself has no particular acoustic properties worth keeping for posterity. To truly capture the highest sound fidelity of the audio performance one should be looking to archive the original masters (assuming they still exist in some climate-controlled vault somewhere) or their vinyl/LP/CD counterparts (assuming it was released on those formats to begin with) at the highest possible sampling rate, then saved in a lossless format. As for the cassette, mere documentation of the product’s existence will have to do. Sure, I certainly will rip a few select tapes for my personal music library, and those which impressed me enough will simply get re-procured as regular or special edition CDs. Some might even fetch a few bucks on the second-hand market. As for the rest? Rubbish. Garbage. Give-aways. Even if I had the time and inclination to rip each and every one of these tapes… well, then what? The law won’t take kindly to me selling copies on CD-R (to offset my costs), and the law won’t budge if I claimed those rips are available online for, you know, “educational and historical reasons”. These aren’t awesome tapes from Africa (by musicians who, ironically, appreciate all the exposure they can get), this is commercial fluff — many of them are awful tapes from Europe which should rather be forgotten entirely but, in an even more fiendish twist of irony, are already quite well-preserved in “the Cloud”: You’ll find most of this trash available on places like iTunes and/or AmazonMP3 for the bargain-bin price of 99c per track! Fine. Let them do the dirty work. Let them be the smart ones who have decided on our behalf that vinyl records are cumbersome and that CDs have lost their lustre by re-selling to us something that we may already own. Let their clever marketing machinery and peer pressure also sell us the idea that tapes are the retarded cousin you wouldn’t want to be seen in public with. Let them revel in the illusion that physical media has no value but oh! The songs on it, oh, those are so priceless that the mere thought of ripping and sharing them online is to be considered so heinous a crime that lobbying for “three strike” policies to ISPs or suing to the tune of $150,000 per “shared” tune are considered balanced countermeasures. Let corporate greed ensure that the majority of “European” recordings will survive for future generations to gush over. Let them re-sell the same sounds, re-purposed, because, for some bizarre reason, consumers are quite willing to fork out on a ringtone over and above the hundreds of dollars for the device that plays it and the service that delivers it, but they balk at paying for music. The flaws of the music business model from the days of physical media are now simply being uncovered because they were incorrectly applied to downloadable/streaming media as the importance of music itself takes a back seat to alternative media like games that weren’t as commercially viable years ago and we gladly pay top dollar for. Yes, piracy is wrong. Making money off an artist’s back without him seeing fair compensation is illegal — as it should be. But it could also be argued that it’s just as morally reprehensible to force me to pay again and again for a “downloadable version” of an album I already own while services like Spotify fight over licenses in order to coax me into buying a subscription so I can “stream” music I already have. It is only bankable artists who can hope to make either profit or ends meet through their craft alone — providing they have the backing of one of those big, bad music companies or, alternatively, through initial sales of their work on physical media, and even then it had better be something special: the old adages of “scarcity vs. availability” and “supply and demand” still hold true as you’re likely able to find most of your favourite songs from your teenage years readily available via iTunes — all but the really obscure stuff, those non-album tracks, those B-sides, those stubborn indie artists of yesteryear, or the ones who snub those platforms today and maintain their home-made punk ethics to “stick it to The Man” and honestly don’t care or indeed even encourage fans to copy and distribute their work. Well, if you take iTunes as the pinnacle of music consumerism today, I’d never have imagined to someday find Dead Kennedys, Negativland or Einstürzende Neubauten available there — products as commercial and disposable as a tub of margarine. Things have certainly changed. 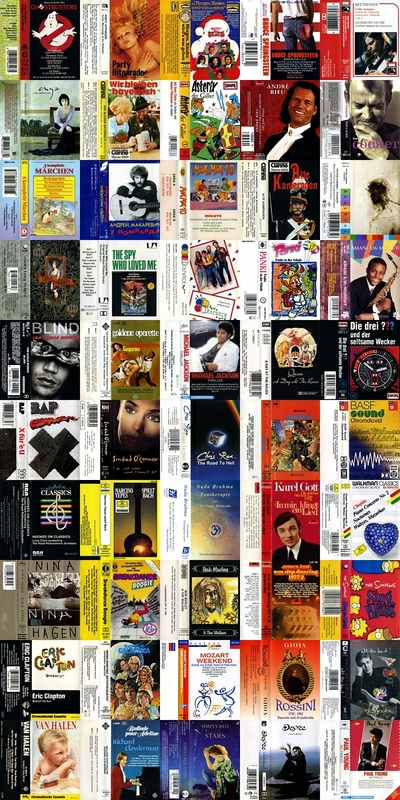 While their work, in audio form, will continue to be accessible to the consumer/fan in digital form and for all eternity (read: archived), second-hand physical media is just about near worthless these days — unless it’s a mint copy of a small Japanese audiophile pressing run or the physical object is as much part of the art as the audio. One statement regularly made is that artists can still make some money through live performances, merchandising (oh, how commercial), licensing, and, oddly, the sale of physical media. What doesn’t get said is that the latter is a once-only transaction: the sale of second-hand records via eBay or other platforms scores them nothing while services like Momox buy “used” media at dirt cheap prices from “original” owners, only to re-sell it elsewhere (such as their own Medimops store) at a profit which lines their pockets — and not that of the artist. It’s quite ironic then that places like iTunes and AmazonMP3 are the ones who may provide that perpetual income for the artist — and their musical legacy could be considered “archived”, too. Physical media? Nope. Collectors are becoming few. Players are falling apart. Manufacturers are exploring other product lines. If it’s mint (read: unplayed) it might be worth something (assuming the artist is somehow relevant, collectable, not too commercial, and has a following with a disposable income). Standard teenage pop becomes near worthless the month after the novelty wears off. On the flip side, it is limited editions or quality bootlegs of the same (on account of their scarcity) that may even fetch something on the market at prices beyond the buying power of a monthly allowance. There’s a fine balance between collectability and commerce at play. Case in point: Take a look at any of the “Most expensive items sold in Discogs Marketplace” and you’ll find that each month’s priciest transaction is a rare or obscure slab of vinyl, of the psychedelic/punk/doom rock/funk/hip-hop persuasion, and traded for something in the region of $1000. As for tapes, well, unless they’re original mixtapes by Grandmaster Flash or legendary sets from the 90’s UK rave scene, part of a box set, demos, obscure, banned, home-made, childishly vulgar, or include bodily fluids by the band members, then they’re worthless. Here’s a list of the “Most Expensive Cassettes at Discogs” that changed hands during September 2012 (thanks, Jason). My hundreds of tapes are worthless. Although they provided me with months and months of entertainment and frustration alike, the majority are “uninteresting” and barely worth archiving by an individual. There’s no way my efforts can compete with the “Musikarchiv Leipzig“. Let the experts at the German National Library deal with the task; they have the mandate, the equipment, the time, the staff and the sponsors to take care of it. This entry was posted in Cassette and tagged archival, digitization, discogs, marketing, music, OCD. Bookmark the permalink.